China is talking up its achievement of mining flammable ice for the first time from underneath the South China Sea. The fuel-hungry country has been pursuing the energy source, located at the bottom of oceans and in polar regions, for nearly two decades. China's minister of land and resources, Jiang Daming, said Thursday that the successful collection of the frozen fuel was "a major breakthrough that may lead to a global energy revolution," according to state media. 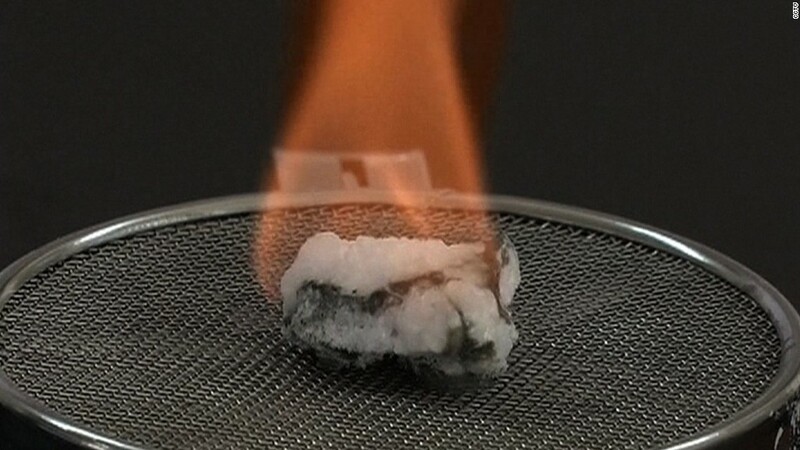 Experts agree that flammable ice could be a game changer for the energy industry, similar to the U.S. shale boom. But they caution that big barriers -- both technological and environmental -- need to be cleared to build an industry around the frozen fuel, which is also known as gas hydrate. China, the world's largest energy consumer, isn't the first country to make headway with flammable ice. Japan drilled into it in the Pacific and extracted gas in 2013 -- and then did so again earlier this month. The U.S. government has its own long-running research program into the fuel. The world's resources of flammable ice -- in which gas is stored in cages of water molecules -- are vast. Gas hydrates are estimated to hold more carbon than all the world's other fossil fuels combined, according to the U.S. Geological Survey. 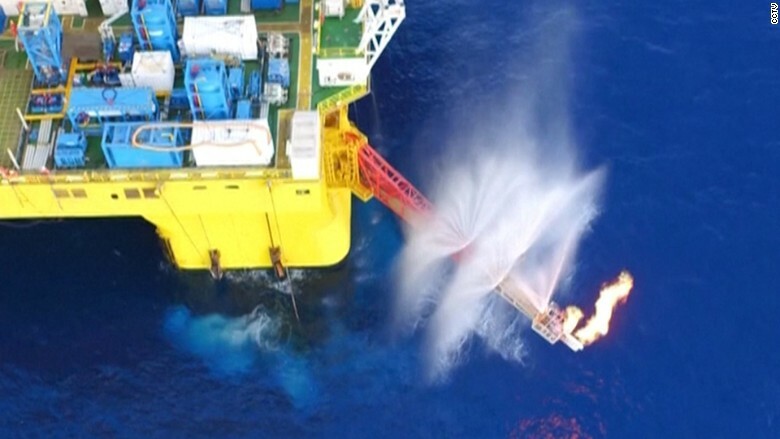 An image from Chinese state television shows gas extracted from flammable ice burning in the South China Sea. And it's densely packed: one cubic foot of flammable ice holds 164 cubic feet of regular natural gas, according to the U.S. Energy Information Administration. Chinese state news agency Xinhua says that makes the fuel a strong contender to replace regular oil and natural gas. But like any fossil fuel, flammable ice raises significant environmental concerns. Related: Is China unstoppable in the South China Sea? Experts worry about the release of methane, a superpotent greenhouse gas with 25 times as much global warming potential as carbon dioxide. And although burning natural gas is cleaner than coal, it still creates carbon emissions. The fuel source has a lot of potential in China, analysts at Morgan Stanley said Thursday, citing the country's successful trial and government support to develop the industry. But commercial production is unlikely in the next three years due to high costs, potential environmental concerns and technological barriers, the analysts said in a research note. "If there is a real breakthrough," they wrote, "it could be as significant as the shale revolution in the United States. Under such a bull case scenario, we'd expect a significant increase in offshore exploration and production activities." 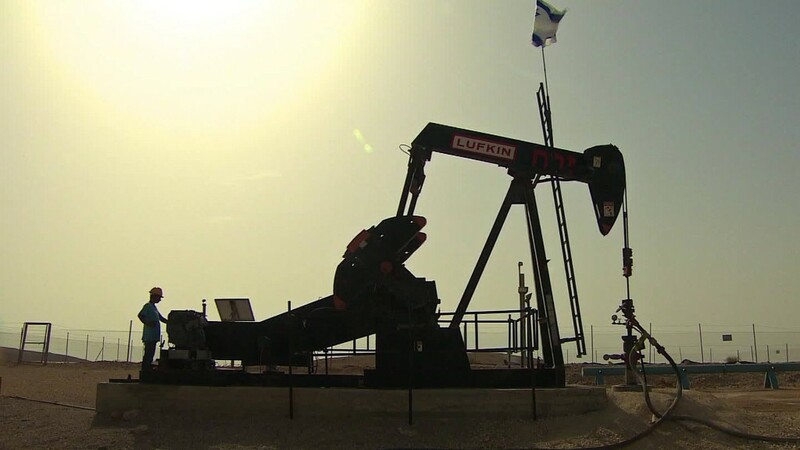 Oil services and equipment stocks listed in China surged Thursday following the Chinese government's announcement, with China Oilfield Services and Sinopec Oilfield Equipment ending the day 10% higher. Meanwhile, China's regional rival Japan is pushing ahead with its own efforts. With limited domestic energy resources, Japan is a big importer of natural gas. And its heavy dependence on nuclear power was thrown into doubt by the Fukushima Daiichi power plant disaster in 2011.